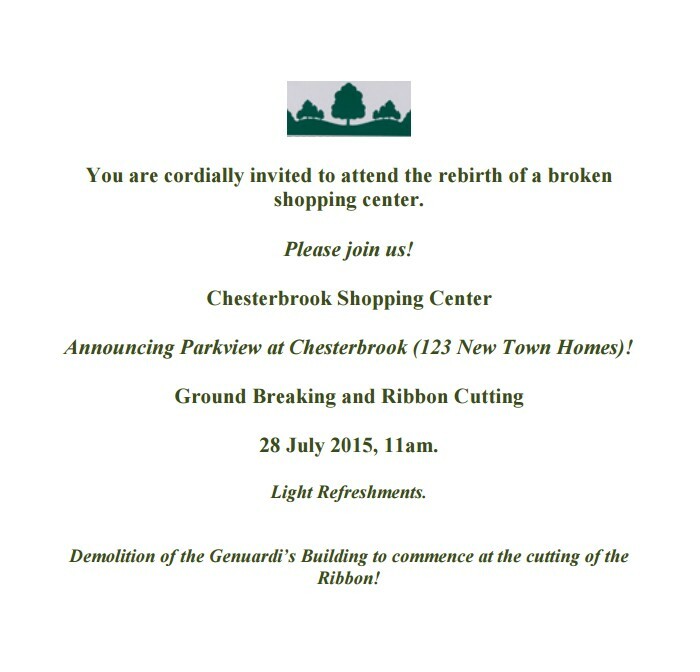 Official ground breaking & ribbon-cutting for Chesterbrook … “rebirth of a broken shopping center” Public Invited! If you live in Chesterbrook or have driven on Chesterbrook Boulevard by the Chesterbrook Shopping Center during the last several months, you will have seen obvious signs of the long awaited redevelopment project which includes both razing and resurrection. The center’s mixed-use development plan uses Tredyffrin’s newly created Town Center District for the 13-acre site with 123 new residential town homes, ‘Parkview at Chesterbrook’ and 30,000+ sq. ft. of commercial space (utilizing the front row of the existing building). Chesterbrook Shopping Center redevelopment project is underway — Its time has finally come! If you have driven on Chesterbrook Boulevard by the Chesterbrook Shopping Center during the last several months, you will have seen obvious signs of the long awaited redevelopment project which includes both razing and resurrection. The Chesterbrook Shopping Center was constructed in 1981 with 122,000 plus square feet of retail, including the Genuardi’s grocery store as its anchor. Poor visibility, competition (Trader Joes, Whole Foods, etc. ), shopping center design flaws and ultimately the economic downturn all contributed to the center’s demise. As stores moved out and remained empty, shoppers looked to other centers as their main shopping destination. In the last five years since Genuardi’s left the Chesterbrook location in 2010, it has been difficult to watch the center’s decline. Purchased in 2013 by 500 Chesterbrook Boulevard LP, the owners of the shopping center complex, including Tredyffrin Township resident Bob Whalen, have successfully maneuvered their redevelopment plans through Tredyffrin Township’s Planning Commission, with final approval from the township’s Board of Supervisors. 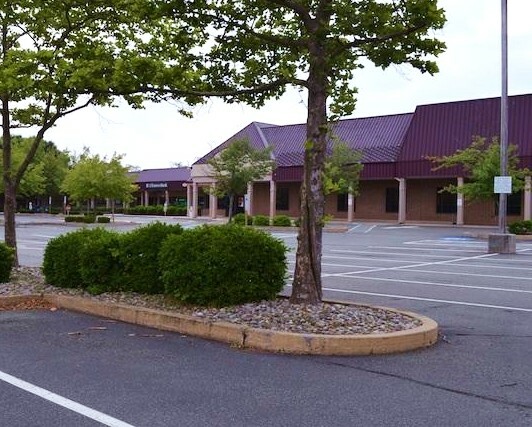 Whalen, owner of RW Partners and Brian McElwee, owner of Valley Forge Investment Corp. partnered for the purchase and redevelopment of the Chesterbrook Shopping Center site. The center’s plan is for a mixed-use development with 123 townhomes (their location is indicated on the map below). The plan for the 13-acre site contains 30,000+ sq. ft. of commercial space (utilizing the front row of the existing building) and new residential townhouses in the newly created Town Center District. The new design for the center by Goodwin Architects razes a large portion of the current shopping center including the Genuardi’s store and the back row of stores. A small retail strip will remain and local favorite Diane’s Sidewalk Deli will continue to operate at its present location. The Rite Aid drug store will move from its current location to a larger space in the new retail strip. I was assured that all other displaced tenants received the option of relocating to the reconfigured retail center. Wells Fargo Bank will continue in its present location but presumably will have a face-lift to match the upgrades coming to the othe r storefronts. The redevelopment of the Chesterbrook Shopping Center is long overdue – this project is a win-win for the neighboring residents, the corporate employees working in Chesterbrook and other township residents, who like me, drive through the area regularly. Here’s hoping that the exciting new retail and residential project marks a redevelopment renaissance in the area, as it breathes new life into the Chesterbrook community. There is an update with forward movement on the Chesterbrook Shopping Center redevelopment project! The developers of the shopping center, 500 Chesterbrook Boulevard LP, will appear in front of the Planning Commission on Monday, April 27, 7 PM to review the preliminary/final subdivision application for the site. The developers plan is to redevelop the existing 13-acre site, which contains approximately 122,000 sq. ft. of commercial space, into a mixed used development. Their plan contains approximately 31,000 sq. ft. of commercial space (utilizing a portion of the existing building) and 124 residential townhouses in the newly created Town Center District. It has been nearly 4 years since Genuardi’s in the Chesterbrook Shopping Center closed. With the departure of the 40,000 square foot grocery store, the Center saw a significant drop in foot traffic and began a downward spiral as the empty storefronts continued. The redevelopment of the Chesterbrook Shopping Center is very overdue – this project is going to be a win-win for the neighboring residents, the corporate employees working in Chesterbrook and other township residents, who like me, drive through the area regularly. Also in front of the Planning Commissioners on Monday is the Wayne Glen development project. Unlike the widespread community support that developers have enjoyed with the Chesterbrook redevelopment plans, the Arcadia Land Company project ‘Wayne Glen’ at the northwest corner of the intersection of Swedesford and Old Eagle Roads, has seen its share of spirited debate. The proposed Wayne Glen project is a mixed-use development with carriage homes and townhouses plus an office-building component. The issue for the residents close to the Richter Tract is how the developer will manage the stormwater situation as much of this area, including Glenhardie, is prone to regular flooding. The Wayne Glen project is located in the Trout Creek Overlay District and the Arcadia developers believe that their plan will utilize design techniques that will alleviate the erosion along the stream banks and flooding issues and improve the poor water quality. On Monday, the Planning Commissioners will consider Arcadia’s conditional use application to construct 104 residential units in the R-1 Residential District and approximately 240,000 sq. ft. of non-residential building area in the Professional District. The target audience for the residential construction in both the Wayne Glen and Chesterbrook projects is the age 55 and over market – the emptynesters and those people interested in downsizing from their large single family homes. However, with a combined increase of approximately 230 new residences between the two projects, the possibility does exist for additional school age children for the T/E School District. Typically, there is representation at these Planning Commission meetings by the School Board. However, the Planning Commission meeting on Monday conflicts with the regularly monthly meeting of the School Board. As an aside, at the last Public Information Meeting this past week, Barb Jackson, an Easttown resident and T/E parent, asked about Dr. Waters contract and whether he would be retiring when his contract ended in June 2015. After Waters confirmed that he would retire, a follow-up question was asked regarding the search committee and process to find a replacement. Although not listed on the School Board meeting agenda for Monday, Board President Kevin Buraks told those of us at the meeting that the Board would give the specific details on the superintendent search at the upcoming school board meeting on Monday. Tredyffrin Twp Planning Commission agenda — Chesterbrook Shopping Center project & Plans for 250-unit multifamily building in Paoli! The upcoming Planning Commission meeting on Thursday has a couple of major township redevelopment projects on the agenda for discussion – Chesterbrook Shopping Center and 250 unit multi-family building with structured parking in Paoli. The applicant for the Chesterbrook Shopping Center project, 500 Chesterbrook Boulevard, LP is back in front of the Planning Commissioners regarding the proposed text amendments to the Town Center District (TCD). The proposed TCD changes included amending the standard for building height, sidewalks, parking, building façade and the steep slope regulation, to differentiate for manmade steep slopes. The Planning Commission originally approved the TCD zoning changes on November 21 and sent it to the Board of Supervisors for review at their December 16 meeting. However, after discussion and community input, the supervisors sent the proposed TCD text amendments back to the PC for further work that will happen at Thursday’s meeting. One of the sticking points in the proposed zoning changes is in regards to steep slopes; the current TCD ordinance differentiates between natural and manmade slopes but makes no distinction from a regulatory standpoint – both have the same requirements. It is the suggestion of the applicant that if the slope is manmade because of a prior development (which is the case at the Chesterbrook Shopping Center), it should not need to be preserved – especially when considering that much of the development affected by this will be redevelopment. For those that don’t know, the backside of Chesterbrook Shopping Center (Wilson Farm Park side) is multi-story; the slope created as part of the original development plan when the center was constructed. Ever since Genuardi’s closed 3-1/2 years ago, the center has continued its spiral downward. Unlike the retail stores that may close along Rt. 252 or Lancaster Avenue, the Chesterbrook Shopping Center is the core of Chesterbrook – it’s their town center. The redevelopment of the Chesterbrook Shopping Center is very overdue – this project is going to be a win-win for the neighboring residents, the corporate employees working in Chesterbrook and other township residents, who like I drive through the area regularly. I hope that the 500 Chesterbrook Boulevard, LP developer can successfully maneuverer any remaining obstacles regarding the text amendment zoning changes and this exciting project can move forward! I wish I could say that I was as positive about the proposed Paoli redevelopment project as I am about the Chesterbrook Shopping Center. The owner of Station Square (a group of dated office buildings at the corner of East Central and N. Valley Road), the Palmer Group is proposing a 250-unit multifamily building with structured parking plan at this site adjacent to the Paoli Train Station. Having just praised the plans for the Chesterbrook Shopping Center, my objection to the Station Square project has nothing to do with not supporting redevelopment. There are so many issues surrounding the proposed Station Square project, it’s hard to know where to start. First off, for anyone that travels on North Valley Road or Central Avenue during either morning or afternoon rush hours, you know how much traffic already exists in this area of the township. Certainly, the employees working in the existing Station Square office buildings contribute to the traffic although a certain number probably use the convenient adjacent public transportation. However, any additional traffic from the Station Square office workers is Monday-Friday, 9 – 5 type of traffic. However, the addition of a 250 unit multifamily building in this location and the traffic is compounded – and it’s 24/7 traffic. The residents of Valley Hills already face major morning and afternoon traffic challenges maneuvering from their community onto E. Central and N. Valley roads – I cannot imagine how the local roads will handle the traffic created by an additional 250 families or the quality of life effect on the neighbors. I am certain that an argument to support this proposed project is that it is part of of the Paoli Transit Center and Paoli redevelopment vision. However, I have problems with the density of the development and the additional traffic issues such a project will cause. One of the arguments regularly used by residents opposing the Wayne Glen development project is the potential additional students into the T/E School District. The targeted audience for the proposed Wayne Glen townhouses and carriage homes and the new Chesterbrook townhouses is the 55+ buyer but that has not kept that argument from being made. However, my guess is the planned 250-unit multifamily building in Paoli is going to appeal to families with children and will provide a lower cost way to enjoy the benefits of the T/E schools. As an aside, it is clear from attending school board meetings that many of our schools are currently operating at near capacity and this proposed Station Square multifamily building could have a dramatic effect on the school district enrollment. According to the Planning Commission agenda, the developer will provide a sketch plan of the Station Square project. This is the first opportunity for residents to hear about the concept and see the plans – I look forward to hearing how the developer plans to resolve the additional traffic issues and density concerns. Chesterbrook Shopping Center sold at auction for $8.9 million — Here’s hoping that there’s brighter days ahead! Like many people living in the western section of Tredyffrin, I use Chesterbrook Boulevard to go to Gateway Shopping Center or Valley Forge Park, which has me regularly passing by the sad, nearly empty Chesterbrook Shopping Center. Developed in the early 1980’s, the Chesterbrook Shopping Center is located in the middle a planned mixed-use community that includes the Chesterbrook Corporate Center and the 865-acre residential community. The 122,216 square foot shopping center lost its anchor store, Genuadi’s supermarket in August 2010. With the departure of the 40,000 square foot grocery store, the Center saw a significant drop in foot traffic and began a downward spiral as the empty storefronts continued. Routinely on the weekends, the left side of the parking lot at Chesterbrook poses as a used car location, regularly sporting 5 or 6 cars with their sale signs in the window. In June of this year, the Center went into foreclosure – Chesterbrook Village Center Associates (owned by Brixmor Property Group) owed their lender approximately $9.5 million. As a point of record, Brixmor purchased Centro Properties Group in 2011 (for a price of $9.4 billion), which included the Chesterbrook Shopping Center. Each time the property changed hands; local residents would get excited, expecting that improvements and updates to the center would happen. Unfortunately, that was never the case. The saga of the Chesterbrook Village Center continues. On Friday, November 1, the Chesterbrook Village Center was sold to 500 Chesterbrook Boulevard, LP, the current lender, for a credit bid price of $8,918,291.05. That is the approximate amount of the mortgage debt held by 500 Chesterbrook on the Center. There were no other bids. Final closing and delivery of the deed should occur no more than twenty days after the sale, if everything proceeds as anticipated. The public Recieiver’s Sale (foreclosure sale) was conducted by the Court–appointed receiver, Valley Forge Investment Corporation, at the offices of Dinsmore & Stohl LLP pursuant to an order of the United States District Courts of the Eastern District of Pennsylvania. According to Richard A. O’Halloran, Esq., foreclosure counsel for 500 Chesterbrook, Valley Investment Corporation, the receiver, and 500 Chesterbrook, the lender and winning bidder, are not affiliated. Mr. O’Halloran also stated that 500 Boulevard was retaining its options for the Center, including owning and developing, or selling, and had not decided on proposed plans for the Center. This most recent troubled chapter in the Chesterbrook Village Center saga may be coming to an end. But there is a long way to go. Let’s hope that this is a true start rather than another one of the many false starts we have seen for the Center. 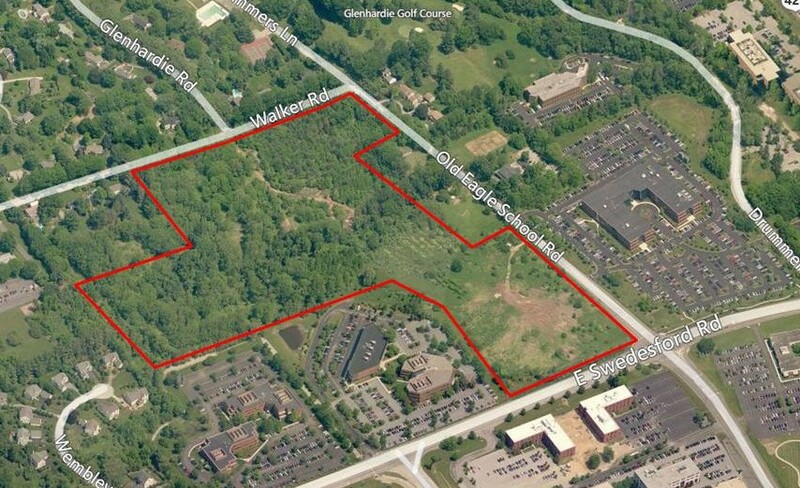 The ultimate developer will need to meet with Chesterbrook residents to openly discuss future plans for the Center. The redevelopment of the Chesterbrook Village Center will be significant for the Chesterbrook community and Tredyffrin Township. The Tredyffrin Planning Commission, the Board of Supervisors, and the developer should engage residents and business owners in the project approval process at each step. 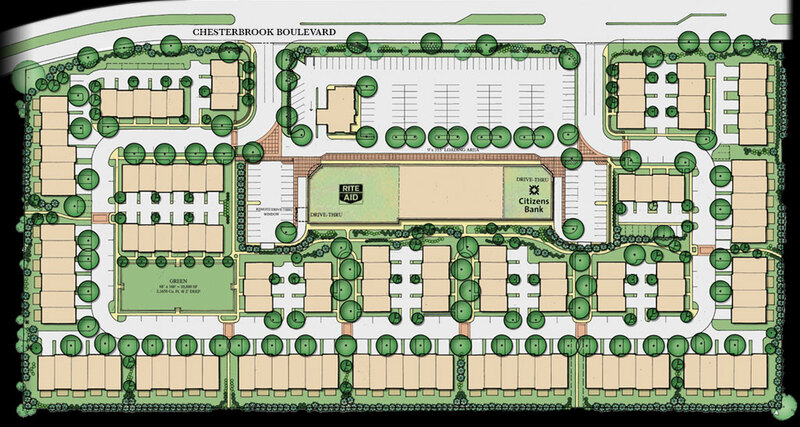 This is an opportunity for everyone affected to work together for community-friendly redevelopment that forges a new beginning for the Chesterbrook Village Center and benefits the residents of Chesterbrook. Thanks Murph for attending the auction and providing this valuable information on the sale of the Chesterbrook Shopping Center; I hope that the Center is now on to a brighter future. Certainly, the property does present its own set of challenges and its dated look is screaming for a ‘makeover’ but it’s a goldmine redevelopment opportunity for a the right developer! Here’s hoping that there’s better days ahead for Chesterbrook Shopping Center and that it’s time has finally come! Many of us have been distracted by the excitement of recent opening of Wegmans grocery store. However, in about 3-1/2 weeks, the Chesterbrook community and its neighbors (me included) are going to be faced with the stark reality of the closing of Genuardi’s grocery store. Citing economic reasons for the closing by the owners of the store (Safeway), the announced closing date is August 21. Last month when I discussed Genuardi’s closing and the effect that it might have on the Chesterbrook community, it was met with some criticism. But I think over the last 30 days since the owners announced the store’s closing, the impact of the closure has begun to set in; there has been a growing concern by members of the Chesterbrook community relating to several issues. For those residents living in Chesterbrook that do not have access to cars, Genuardi’s closing may present a negative impact on their health and economy without easy access to a local full-service grocery store. I have received several emails from retirees who depend on Genuardi’s (and also the drug store which is rumored to be the next to close) for their shopping needs as well as medical needs. I know some bristled when I questioned whether a large empty store in a shopping center could have an adverse affect on local housing values. From a long-range standpoint, it would probably be a reasonable guess that an empty anchor store in a residential community shopping area is unlikely to ‘increase’ the value of neighboring properties. We can hope that the shopping center continues to be completely maintained while the space remains vacant and available for lease. I found your June 22nd article about the Genuardi’s closing very informative. I sent it to a friend of mine who remains insistent that the Shopping Center has been sold to a developer who will be turning it into some kind of retirement center. I tried to google that info but came up empty. Can you offer a definitive answer to this issue? There is a dinner bet at stake…lol. Rumors continue to swirl that Chesterbrook Shopping Center has been sold to a developer and the property will be re-designed as a retirement center. At the July Board of Supervisors meeting, township manager Mimi Gleason was questioned about this rumor. Her response was that she knew of no sale of the property, and further stated that the township had not been approached with a proposed land development project for the property. I contacted the leasing agent for Chesterbrook at Centro Property but my call has not yet been returned. Their website indicates that Genuardi’s space of 38,502 sq. ft. is available for lease. I reviewed the floorplan of Chesterbrook Shopping Center on Centro’s website and counted the total number of rental units in the Chesterbrook Shopping Center as 42 separate units. I then counted those units that are indicated as ‘available for lease’ and the number was 19. Nearly one-half of the available units in the shopping center are now available for lease, including Genuardi’s. With the addition of Genuardi’s grocery store to the list of ‘available for lease’ units in Chesterbrook Shopping Center, my guess is that greater than 50% of total square footage in the shopping center is now empty. With an approximate 50% occupancy rate in Chesterbrook Shopping Center (after Genuardi’s closes) I think that there is need for real concern. For those of you who live in one of the villages of Chesterbrook, how do you feel? Where does the Chesterbrook Civic Association stand on this? Is there any kind of pro-active movement by the residents to help turn the commercial area of Chesterbrook around?